I was fortunate enough to go on a trip to Cuba last October. What a fantastic country; such warm, friendly people with a thirst for life and incredible resourcefulness, fabulous and varied scenery and an abundance of Mojito! Before setting off i’d arranged to visit La Universidad de Oriente in Santiago de Cuba and offered my services to deliver some training for researchers (postgraduates and lecturers) on writing basic web pages and the potential of online tools for collaboration. I was traveling with my father, accompanying him on his second fieldtrip to Cuba, hunting down his chosen subjects – snails. Now, searching for snails isn’t one of my preferred pastimes, arousing childhood memories of being coaxed out on the odd dark, damp snail-hunt through the Hampshire countryside in the very early hours. But these are Polymita picta – brilliantly bright and colourful and found only in the sandy, palm-fringed eastern corner of Cuba. Perhaps that explains my sudden attraction! But not internet connections it would appear! I was to find out more on arrival; tropical rainfall and web servers don’t go hand-in-hand. In fact, the servers are turned off to protect them when it rains, which it does a lot during the rainy season. Thoughts of home and our reaction to the briefest lack of connectivity… Hmmm, first lesson learnt I think! We arrived in Cuba to sweltering, sweaty, sunshine; such a glorious change to the fast approaching UK winter. After a night in Holguin we traveled to Santiago de Cuba where we rested, slept and headed the next day to the University. My first session was to be at 8am, definitely the earliest start to a Netskills workshop i’ve delivered. However, due to the rains there was no connection, so my workshop was postponed – for a week! – and I was taken on a tour round campus. It was immediately evident that there was an extremely open approach to teaching, learning and working. Seminars were being held outside and there was a general hubbub of noise as lecturers lectured, students discussed, and staff held meetings. Not so different to home, but I got the distinct impression nobody was ever going to be shusshed or caught sending an email to a colleague down the corridor in shouting distance! I was taken to the library which had also been shut for a number of days due to the downpours, but seemed well stocked and with plenty of open areas for self study … Just watch out for the puddles and the damp tables by the open windows! 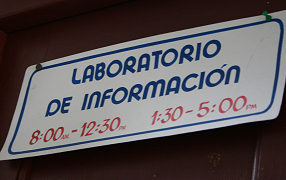 Downstairs in the library is the Laboratorio de Información, more commonly referred to as “the googleroom.” Unfortunately it was also shut due to the power outage but I was told (by the slightly scary Library manager – no comment!) that it’s an extremely popular room; inside are ten networked computers that can be booked for use in thirty minute blocks. Next we popped into the Centre for English Studies where I had an interesting chat with a professor of English and his linguist colleague, whose eyes lit up when I mentioned my former research areas; phonetics and sociolinguistics, talking about second language aquisition and various models of language representation that I really should remember more of. Actually the professor’s original field was Russian Studies, but demand dwindled after the collapse of the Soviet Union in the early ’90s. I asked if they had any partnerships with Universities outside Cuba, but no, they said, unfortunately not. 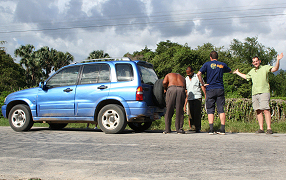 After a week away from Santiago snail hunting near Baracoa on the far east of the island, and after an eventful return journey including a puncture two kilometres from Guantanamo Bay(! ), we returned to fine weather, no rain and a 100% intermittent internet connection – quick, time to deliver my training! The sessions were a great success and thoroughly enjoyable to run. Attending were a mixture of staff and research students, keen to learn and also to cascade knowledge to colleagues and friends. The main focus of the sessions was on creating structured HTML content for teaching and research purposes, attendees keen to know how to keep file sizes and images small for quick transfer. Interestingly demand for our ‘Web Pages From Scratch’ workshop, popular pretty much since Netskills started, has dipped over the last year or two, probably as we see people move towards more sophisticated web-based tools and services. But the framework for any website, whatever your connection, however elaborate your design, and wherever you are around the globe, is provided by a sound structure. Another lesson for us back home, where we tend to be wowed by the (admittedly exciting!) possibilities provided by faster and faster network connections. 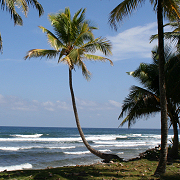 This entry was posted in cuba, html, netskills, snails, travel, Uncategorized on May 6, 2008 by Will Allen. Take me with you next time! 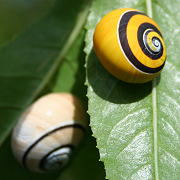 I want to learn simple net skills in a beautiful environment – and find snails as well! This is an extremely well written piece, amusing, interesting and generous spirited. I look forward to reading more. Great piece, thanks for sharing! Isn’t it crazy to think that you can get so close to Guantanamo Bay? Love the snail pic! – with the internet problems, new light on the phrase “snail mail”. What an adventure. Grest report.